I’ve created a few simple sight words games which I use alongside our sight word readers. Some of these printables are in their own post; for others, you’ll need to scroll down a bit in the linked post. I typically teach sight words before we do a lot with phonics. When my children are ready (see 5 things kids need before they’re ready to “sound it out”), we do a lot of phonics learning with word families. Check out my word family page for activities to use alongside sight word games. Tip: Also check out sightwords.com, which is an amazing free site where you can create a variety of games using any sight words! Be sure to check out this post for simple sight word games! 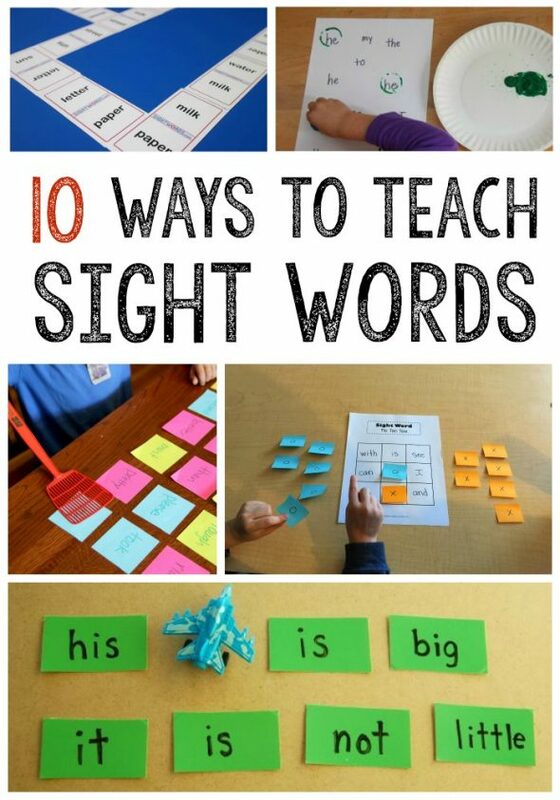 More sight word games – on Pinterest! Follow The Measured Mom’s board Sight Words on Pinterest. I am sure you hear this a lot, but I just want to say THANKS for having such great resources! I am a teacher AND a mom and I have been looking through your page for some great activities to do with my own 3 year old this summer! You have it all laid out so nicely AND it is stuff that I can tell is great thanks to my background in education! Keep up the GREAT work! Thank you so much for your kind words! I love to hear from parents and teachers, and two-in-one is a bonus 🙂 I love what I get to do here and am so thankful for people like you who can use my materials too! Wow! I am super thankful that I have come across your page! I too, have a Masters Degree in Elementary Ed and have left the field to work from home and be here more for my 6 and 3 yr old. I am building some activity binders for some quiet time and some one on one learning time with mommy this summer and your resources are fabulous and well planned. THANK YOU!!! Thank you so much for these great resources. I’ve started using them already. My babies love it! I really appreciate you and all you do. You’re very welcome, and thanks so much for taking the time to comment! Thank you for all your wonderful materials. They have given me so many ideas when I am helping children who have missed out on some of the basic skills. I am a retired teacher and help children whose parents approach me to give their child extra support in their language and maths. You’re very welcome, Sandy! I’m so glad you’re finding things here you can use! This site is terrific! I am a retired high school science teacher and am currently tutoring a kindergarten student and volunteering in her classroom. She likes the activities and is making progress. Thanks a bunch. That’s so wonderful to hear, Mary Ann! Thank you for your comment! That is so wonderful to hear, Marilyn! Thanks so much for letting me know. i want to thank you for such great freebies you have here in your site! We are starting homeschooling with my 3 preschool kids and I was so worried if i can teach them how to read. I was contemplating on buying a very expensive set that would help with teaching phonics then i stumble on your site and it was like my fears just melt away! you are a blessing to many and I pray you will be blessed more! Really, thank you soooo much! I would def hug and take a photo-op with you if i ever see you haha! Thank you!!!! Thank you, Rachelle! This comment was such a day brightener. 🙂 Feel free to ask questions about phonics when you have them! I was wondering–when you do your guided reading groups do you meet with each group each day? Also, do you have a set plan per week, example Monday work on sight words, Tuesday introduce sight word reader, Wednesday review sight word along with reader, etc. If so, what do you do? Thank you!!! Great ideas. Thank you for the great freebies. Hi there. I am no longer a teacher but just wanted to let you know this site was a huge help to me. I am so thankful that there are teachers out there who are just happy to provide support and resources to beginning teachers. I am surprised that you do not have the word “have” in your dabber sight word sets. I use the Dolch sight word lists when creating those. I should have included it in the primer list, but I haven’t double checked.